Burrard Inlet First Nation calls for renewables: "Faced with a six-fold increase in oil tanker traffic in their Burrard Inlet home if Kinder Morgan's pipeline expansion project goes ahead, the Tsleil-Waututh First Nation says it's time for Metro Vancouver and British Columbia to get serious about alternative energy." 'Fractured Land' depicts First Nations' fight to save land from oil and gas industry | The Vancouver Observer: "On the outside, northern British Columbia is a beautiful place. Look closer, though, and a different world appears. A much darker world. One of drilling, mercury-infested water and cancer. A place where people and land suffer the same. A place that disintegrates with each fire explosion in the starless night sky. A place they call Fractured Land." 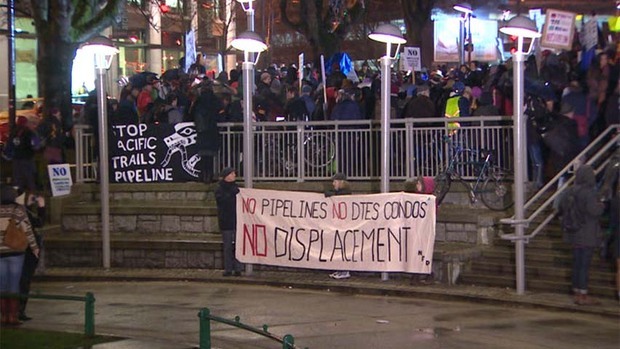 Thousands jeer Northern Gateway hearings in Vancouver - British Columbia - CBC News: "Thousands of people gathered during a rare Vancouver snowfall to mark the start of community hearings on the proposed Northern Gateway pipeline. 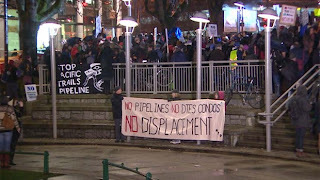 Opponents of the project were bolstered on Monday by the nationwide Idle No More campaign, which brought First Nations from as far as the Haisla Nation on the North Coast, near the would-be tanker port of Kitimat, B.C." New Oil Sands Pipeline Plan Would Dramatically Increase Carbon Emissions | The Energy Collective: "The annual flow of carbon through the proposed twinning project and the proposed Enbridge Northern Gateway project (presuming full operation) would dwarf greenhouse gas emissions from British Columbia, an issue presented here in the past."